The era of car ownership is over. 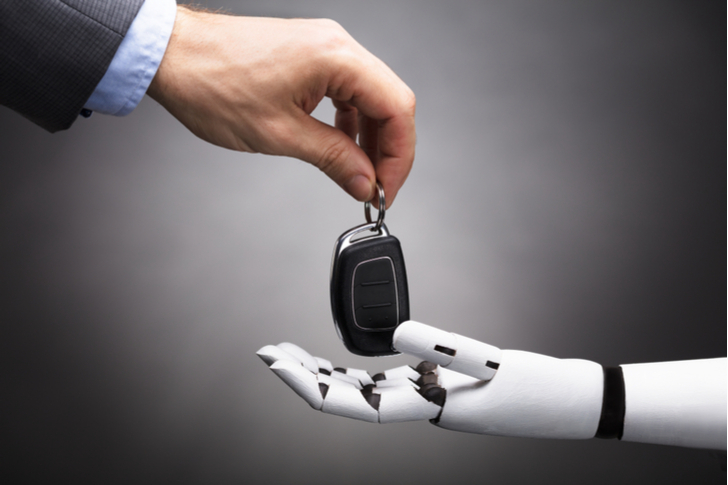 For the past fifty years, the American dream has included putting a car in every garage, with the goal of equipping every individual with modern transportation. But, modern transportation is rapidly evolving, and that means the American dream is rapidly changing, too. The goal is still to equip everyone with modern transportation. But, personal car ownership isn’t the only means of achieving that goal anymore. Now, thanks to technological advancements, smartphone proliferation and the rapid rise of ride-hailing (or ride-booking) services, Americans don’t need a car to get around anymore. Instead, they can rely on ride-hailing and car-booking services for nearly all of their transportation demands. That is largely why car ownership rates have plateaued around 91% of American households for the past decade, versus a trend of consistent car ownership rate increases over the prior half-century. This shift in trend is still in its early stages. Ride-hailing is only growing in popularity and access. Technology is only getting better at improving consumer outcomes in the ride-hailing space. The need to own a car is becoming smaller and smaller. Populations are becoming increasingly urban-centric. Personal car ownership costs are only rising, as are the traffic delay problems associated with having too many cars on the road. Consequently, it increasingly appears like we are in the early stages of a secular decline in car ownership rates. That’s a big deal. For the past fifty-plus years, the trend in car ownership rates has been up. For the next fifty-plus years, the trend will be down. The financial implications of this unprecedented pivot are huge. The most obvious way to play a secular decline in car ownership rates is to buy the stocks of the companies directly responsible for this trend shift. 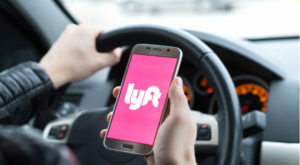 That includes freshly public ride-hailing company Lyft (NASDAQ:LYFT), and its larger, soon-to-be-public peer Uber. Broadly speaking, these two companies are pioneering what is known as the TaaS, or Transportation-as-a-Service, market in North America. At scale, the TaaS market is supposed to make owning a car antiquated, much like the SaaS market made owning on-premise software antiquated, through providing a wide variety of transportation services via an army of drivers to the masses. Importantly, Uber and Lyft are the only two relevant players in this market, and together control 98% of the U.S. ride-hailing market. Right now, this market comprises providing car transportation services for humans trying to get from point A to point B. Naturally, as car ownership rates fall, reliance upon and usage of these services will grow by leaps and bounds. But, that’s just the tip of the iceberg with respect to what Uber and Lyft can do with an army of drivers and programmers. They can tap into logistics (delivering packages from point A to point B) and last mile transportation (scooters and bikes), among other things. Thus, the aggregate opportunity for Lyft and Uber over the next several years as car ownership rates drop is immense, and competition outside of these two giants is essentially zero. That’s why buying LYFT and Uber stocks for the long run makes sense. Another obvious way to play a secular decline in car ownership rates over the next several years is to short the traditional automotive manufacturing sector, since the biggest tailwind which has supported robust growth across this industry over the past half-century (rising car ownership rates) is about to turn into a headwind (falling car ownership rates). Over the past half century, the percentage of no car households in the U.S. has dropped from above 20% to below 10%. But, over the past decade or so, the percentage of no car households has plateaued around 9%, and is actually showing signs of starting to move higher. The implication of lower household car ownership rates means lower total vehicle sales in the U.S. We are already seeing this. 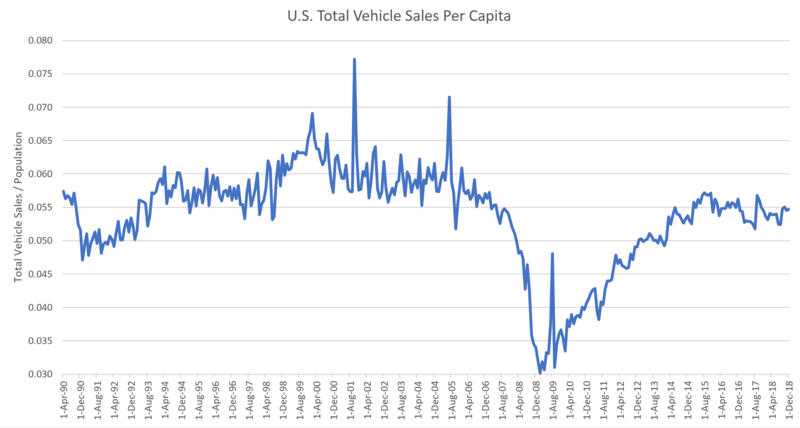 Although car sales have bounced back from the Recession, total vehicle sales per capita remain well off where they were for most of the 2000s. 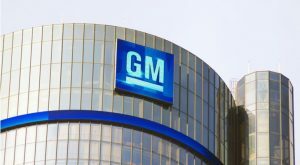 Further, traditional auto giants like General Motors (NYSE:GM), Honda(NYSE:HMC), Toyota (NYSE:TM), and Fiat Chrysler (NYSE:FCAU) are facing stiff competition from new electric vehicle entrants like Tesla (NASDAQ:TSLA). As the EV trend continues to gain traction over the next several years, this competition will only get stiffer, and traditional auto giants will lose more market share. All in all, the outlook for traditional auto giants isn’t great. For the most part, these are companies that are losing market share in a shrinking auto market. That’s a bad combination, meaning that short traditional auto stocks could be a good trade over the next several years as car ownership rates drop. A less obvious way to play a forthcoming car ownership rate reversal trend is to buy the group of stocks that provide ride-booking related services that will see higher demand in a world with lower car ownership rates. 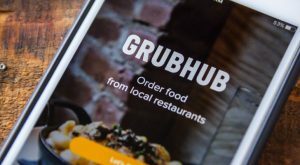 Broadly, this is the class of stocks that provide ride-hailing services in logistics and includes GrubHub (NYSE:GRUB) and soon-to-be-public companies like Postmatesand DoorDash. As car ownership rates drop, and less and less consumers own a car, they will rely more heavily not just on Uber and Lyft’s ride-booking services, but also on GrubHub and DoorDash’s delivery services, too. Consequently, a drop in car ownership rates provides a healthy usage tailwind for these delivery-focused stocks. Further, much like ride sharing, delivery is in the first inning of a massive growth narrative. According to Morgan Stanley numbers, gross food sales in the U.S. restaurant industry measured around $220 billion in 2017, and the digital delivery penetration rate was just 7%. That’s very low. In the home goods sector, the online sales penetration rate is 13%. 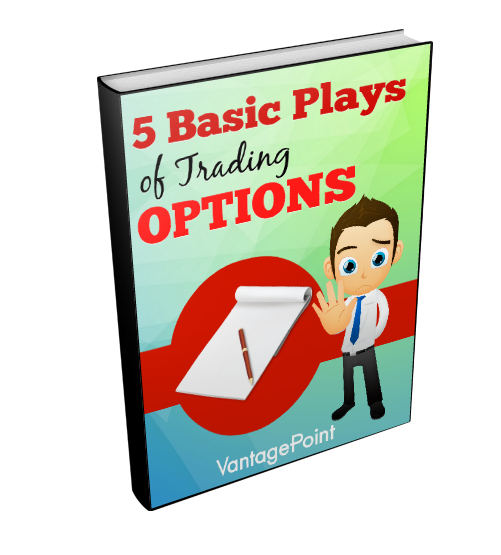 In apparel and consumer electronics, it’s right around 30%. Thus, the runway for growth through further gains in digital penetration is quite long. Overall, online delivery stocks are big winners if/when car ownership rates start dropping over the next several years.